Sanic was designed to run intensive virtual reality games at high settings, and at a steady framerate. VR is much more intensive than normal gaming, so this required substantial hardware. Sanic uses an i7-4790k and a GTX 1080. Exodus was designed to be a base 1080p gaming PC. Exodus was engineered to play modern games at decent quality, while achieving solid framerates, and staying quiet. Exodus uses an i5-4590 with a GTX 950. Smardin was built to run demanding games at high quality, while staying in the budget. We designed this system to use new GPU technology to increase game performance. This system uses an i5-4590 with a GTX 1060. Stormtrooper Rampage was designed to be an entry into 1440p PC gaming at a very high level. This build was designed so that few components would need to be upgraded later on. This system uses a 6-core i7-6800K processor with a GTX 1070 8GB video card. Sanic was built right before Skylake launched, and about when the GTX 1080 was launched (it was very hard to source the GTX 1080). Sanic is a computer designed to run VR games at high resolution, near-max quality, while keeping a steady framerate. VR is much more intensive than normal gaming, so this required substantial hardware. "I definitely recommend Top Flight Computers for those who are interested in creating their own gaming PC, or for those who would like a second opinion on what parts would work best for their specific gaming needs. Very polite, extremely resourceful, and very passionate about helping with building your dream PC into reality." A modern version of Sanic is $2800. Gaming computers as low as $700 are available. Sanic was designed to run intensive virtual reality games at high settings, and at a steady framerate. VR is much more intensive than normal gaming, so this required substantial hardware. Sanic uses a 4-core i7-4790k processor and a GTX 1080 8GB video card. One of my friends from middle school and church asked me about building him a gaming computer not long after I built Sanic in the summer of 2016. Exodus is a computer designed to get in to PC gaming with a normal budget, while not sacrificing performance. Attention was focused on configuring the best power-for-price components. 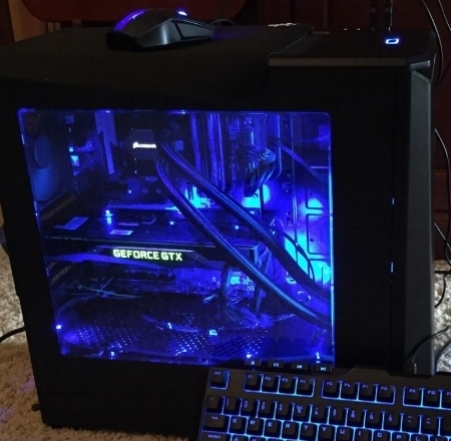 "Chris at Top Flight Computers built me my first gaming PC for my budget of around 1000 dollars. I am extremely pleased with the results. Chris was always available to answer my calls and questions. He is extremely knowledgeable about every aspect and was able to build me the very best PC for the money. 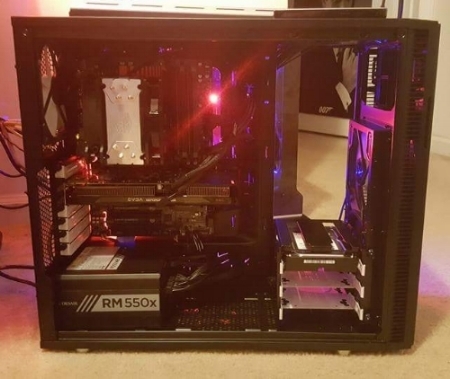 I had some initial issues with my graphics card and he took the time to troubleshoot the problem immediately, it turned out to be just a setup issue. He also offered me a warranty for all of the parts. I plan on calling Top Flight Computers for any questions or concerns regarding my PC. After showing my PC to some of my "computer smart" friends they confirmed that Top Flight Computers indeed did a fantastic job finding me the best parts for my budget. I am able to run very graphically demanding games at 60+ FPS on the highest graphics settings with no issues whatsoever. Overall, I'm very pleased with my experience with Top Flight Computers and plan on consulting Chris for any upgrades I might be considering in the future." A modern version of Exodus is $1300. Gaming computers as low as $700 are available. Exodus was designed to be a base 1080p gaming PC. Exodus was engineered to play modern games at decent quality, while achieving solid framerates, and staying quiet. Exodus uses a 4-core i5-4590 processor and a GTX 950 2GB video card. I built Smardin shortly after building Exodus for a friend from high school. Smardin is a computer designed to allow play of demanding games at high quality, while staying in the budgetary bounds. Attention was focused on configuring the best power-for-price components, while attempting to incorporate the latest GPU technologies. "I had Chris with Top Flight Computers build me a custom computer. It turned out beautifully. Chris was amazing along the way. He checked in often, and was spot on with his recommendations and final selections of components and software. I would recommend him 10 out of 10 times. When the time comes, I will not hesitate to call on him again to build another one." A modern version of Smardin is $1700. Gaming computers as low as $700 are available. Smardin was built to run demanding games at high quality, while staying in the budget. We designed this system to use new GPU technology to increase game performance. This system uses a 4-core i5-4590 processor and a GTX 1060 6GB video card. This client told me that he was looking to design a high-end Star Wars themed gaming PC for his daughter, and attention to detail was a key factor. Stormtrooper Rampage is a system engineered to deliver a rock-solid experience, at very high/max quality. "I have wanted to build a super gaming computer for my daughter for a while, however every time I started to look into the project I was overwhelmed with all of the new technology and decisions on how to build it. I am super OCD and everything I do has to be methodical and thought-out. This presents a problem when trying to find someone to help you, as most businesses now have lost the ability to provide that level of service, and willingness to go beyond customers’ expectations. I found Top Flight Computers and decided to reach out to discuss my vision. My expectations were low, as I have tried other local businesses and only ever ended up back at square one. To my surprise, Chris contacted me back quickly, and we discussed my vision. Chris was very pleasant, and never tried to steer me in any direction other than what I had decided to build. He provided me with the knowledge I needed to make the decision to start the build. Once the build was commissioned, Chris took on the build as if it was his own. I was amazed at what he created in the allotted timeframe he had to get the project completed. Chris exceeded every expectation I had, and created one of the finest computers I have ever owned. Throughout this process with Chris, I realized he is going to be very successful building computers with his attention to detail and his ability to understand all of the ever-changing new technologies. The computer Chris built for me is the Stormtrooper Rampage, look it up on his site, it’s absolutely amazing!" A modern version of Stormtrooper Rampage is $6050. Gaming computers as low as $700 are available. Stormtrooper Rampage was designed to be an entry into 1440p PC gaming at a very high level. Stormtrooper Rampage was designed so that few components would need to be upgraded later on. This system uses a 6-core i7-6800K processor and a GTX 1070 8GB video card.